An excellent side dish this "cold soup" is very appetizing. I love to make this soup during the hot summer days. It is extra refreshing and surprisingly filling! Peel and chop the cucumber into small cubes. To mince the garlic use garlic press if you have one handy. In a salad bowl add the cucumber, garlic, dill and salt. In a separate bowl mix the yogurt with water. Use a fork to blend (it doesn't get lumpy this way). 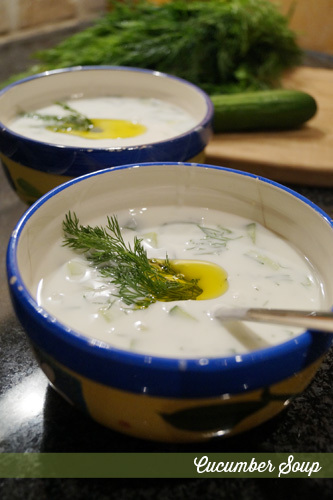 Combine the yogurt with the cucumber mix and add olive oil. Serve chilled. In the summer you can add ice cubes.